Alex Toth spent a portion of twenty-five years of his career doing character design and storyboards for TV animation. And for about a decade after artists and animators passed along to each other huge stacks of those designs (and still do). In 1996, Toth friend and fellow animator Darrell McNeil gathered it all together is one big package, the Alex Toth: by Design book. I was fortunate to snap up a copy upon its release, and good thing I did, 'cause the book fetches around $300 nowadays, long out of print. Folks have taken to selling small stacks of portions of what's included in the book on ebay. From time to time, I'll be scanning and posting some of my favorites from that book. Enjoy! Just a few days before Halloween, a perfect time to feature an Alex Toth horror story! Rude Awakening originally appeared in Creepy #7 (Warren), in 1964; Toth was 36. The story was also reprinted in an All Toth issue (Creepy #139). Toth opens the proceedings with a nice rendition of Uncle Creepy, the ever-present narrator. 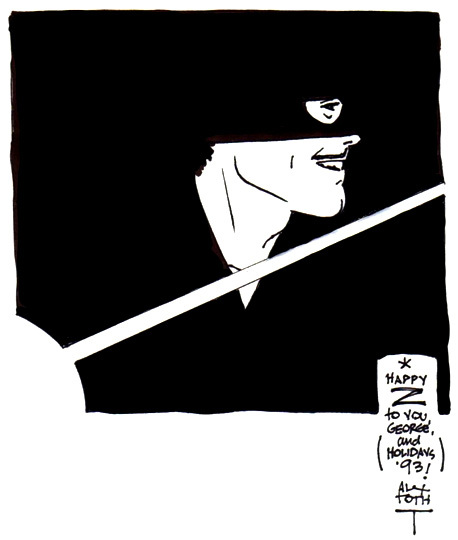 I love Toth's upper/lower-case lettering here, and his signature. Why does a little thing like a nicely-done signature make me so happy? Hmm. "I feel terrible...not sleeping well...nerves shot!" Toth reinforces the off-kilter sensations of the main character with wild, angled panels throughout. Not one to stoop to tricks and snazzy layouts, Toth does so here only when there's a reason. The panel below displays typical Tothisms: spotted blacks; shadows; varied characters and expressions; foreground elements for framing and depth. There's a visual sweep from left to right as one guys leans to grab Mr. Asher's jacket sleeve, creating horizontal folds. Nice grey washes/tones and textures in this frame and the story in general. Having done so many comics for Dell using their 6-panel grid (which he came to enjoy), it must've been liberating to go to town and experiment, no more so than in the page below (page 4). Asher is paranoid, nervous and disoriented, being haunted, chased. Toth smartly uses the perspective in panel 1, extending the angles to form the borders of the four panels below it. What cool page composition! All that black negative space is creepy, indeed. Things don't end well for Asher, as he throws himself out a window, landing in a position not unlike so many characters in Family Guy are shown. Still breathing?! Looks pretty lifeless. But that body has much life! This weird guy with the Hypno-glasses has been after the poor guy the whole story. Even a 3-story fall couldn't save him. Another Halloween approaches, so we feature a Toth page and panel in black and white of the Witching Hour witches! It sure looks as though he lettered and inked these himself. I like how he varies the word balloon shapes here. Swirls of hair, folds of ragged cloaks and crazy cropping create clever compositions weaving our eye about the frames. Nice action, spotted blacks and squiggly textures and fun stars in that last panel (above). Figures, folds and the broomstick direct us sharply through the frame. Boiling Bats of Beelzebub, indeed! Great design in the final frame (below) as Toth varies textures, shapes and angles in this creepy close-up! I've read this dozens of times - can't get enough. Toth's right, I think. I'd been sucked into a myriad of inking/rendering techniques and tricks, trying over the years to strip my work of the stylized garnishments. But they crop up all the time - a tough habit to break! Back to the drawing board/screen...! My Toth book review is further delayed as I'm stricken with a horrible ear ache which has really knocked me for a loop the last several days. At least I'm on antibiotics and have ear drops now, so I'm on the mend, but still a mess. The Ear Ache Effect! And on top of that, I've got a bad cold, too, so I'm drippy, sniffly, coughing, nose-blowy, weak and wobbly. This too shall pass, yes?